A splendid revival of old-school musicals. 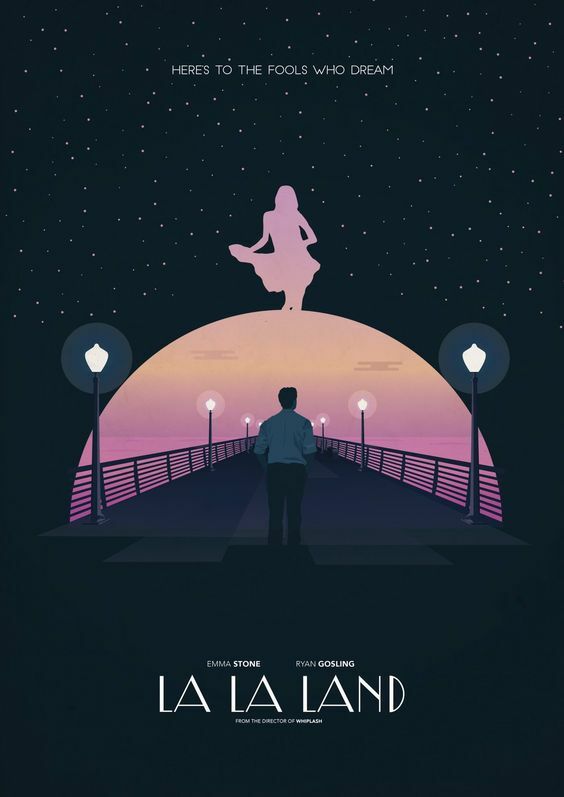 It takes all of 30 seconds for La La Land to establish its identity: an unabashed musical from an era almost forgotten. It proudly embraces the escape from reality as it promptly breaks into song-and-dance routines that punctuate an age old story. The movie begins with our two leads Sebastian (Ryan Gosling) and Mia (Emma Stone) stuck in traffic on the LA freeway in summer. The crowds stuck in traffic break out into a song and dance but our leads are not a part of it. This sets the tone for the rest of the film where we will witness flights of fantasy which aid the main story. Sebastian is a jazz musician, a purist who dreams of opening his own club and doesn’t want to sell out. Emma is an aspiring actress who is tired of waiting for audition calls which are few and call-backs which are fewer still. She works as a waitress in a coffee shop on the Warner Brothers studio lot while he plays popular tunes at a night club secretly trying to weave in his own compositions. They are both passionate artists chasing a dream that is within sight but out of reach. It is not love at first sight but rather a couple of misses before it clicks. And once it does, the two lovers inspire each other to pursue their dreams. Mia starts writing her own play and Sebastian takes up a gig with a friend’s band. But this is where the rubber meets the road: success demands commitment that can take a toll on romance. Chazelle uses seasons as markers for different chapters or segments in the film. We begin with Winter and cycle through seasons throughout. Since this is set in LA where the change is seasons is not very dramatic, Chazelle uses an innovative way of depicting this by his use of colors. Characters wear certain colors to add a little emphasis to the storytelling. (For example, Mia and her actress friends donning primary colors complementing each other.) Chazelle’s use of darkening the screen to focus on a character and transitioning to another sequence works beautifully. The story is not ground-breaking by any stretch of the imagination. We’ve seen this type of tale before: He meets her, they fall in love, love hits a snag and so on. However it’s in telling the tale that Chazelle excels. He clearly loves the classic musicals and it is reflected in the style, the approach, camerawork and even color choices. Except for the current setting, this would fit in quite well with the available options about 4-5 decades ago. The storytelling is more visual than one comes across these days. The two leads communicate through dance moves and nuances more than the words in the script which makes it so enjoyable. Clearly this demands solid performances from the two leads. This is where Chazelle struck gold. Gosling is excellent as usual, adding to a string of memorable performances. To that, add a remarkable turn by Emma Stone. Her Mia starts out as a light frothy character but goes on to display depth and layers. What is more important, at least for this movie, is that these two come across as movie stars, all charismatic and magnetic. A big musical like this needs star power more than a tour de force performance. These are not the best singers or dancers out there but they own the screen when they appear. I think that is what adds to the feel of classic Hollywood musicals. This brings us to the topic of music. The background score by Justin Hurwitz gives the film its identity and provides some memorable tunes. The partnership (Chazelle and Hurwitz) from Whiplash continues to scale new heights and offers a promising future. Unlike a Broadway show brought to the screen such as Les Miserables, this is an original musical in the tradition of some of the movies (Singing in the Rain) it evokes without explicitly mimicking them. Also, it pays tribute to my all time favorite, Casablanca, both with a direct reference as well as subtle nod in its storytelling. While the whole movie is above par, there are few outstanding scenes. The first is when Mia and Sebastian are on a hill over the canyon with a view of Los Angeles as the sun is setting and they break into a song number, A Lovely Night. This is truly a throwback to Rogers and Astaire. The second one is following their outing to see Rebel Without a Cause when the pair ends up at Griffith Observatory. It is a fantasy sequence where they dance in the gallery, end up in the planetarium and float up to the dome and among the stars. This is beautifully choreographed and filmed. Another scene of note is towards the end where an alternate ending is presented in a long interpretive dance as an epilogue. It is masterfully done and is perhaps the centerpiece of the film. With a record number of Oscar nominations, the film is certainly not going unnoticed but I would be remiss in not recommending this on the big screen. Filmed in CinemaScope with an aspect ratio of 2.55:1, it is intended to be viewed on a majestic widescreen it deserves. This is certainly worthy of being called the picture of the year.